Whether you’re choosing a new enterprise ecommerce platform for your online business, or considering a platform migration, choosing Shopify vs Magento is not an easy choice. But when it comes to ecommerce performance, it pays to take a look at the data. Littledata has a range of customers on different ecommerce platforms, with a majority of larger stores using Shopify Plus or Magento. So which platform has the best ecommerce performance? For this post, we crunched data from 1,600 Shopify and Magento stores to see where the platforms typically perform best, from technical performance essentials like site speed, to ecommerce essentials like conversion rate and average order value. Littledata benchmarks stores using our platform on 30 key metrics. 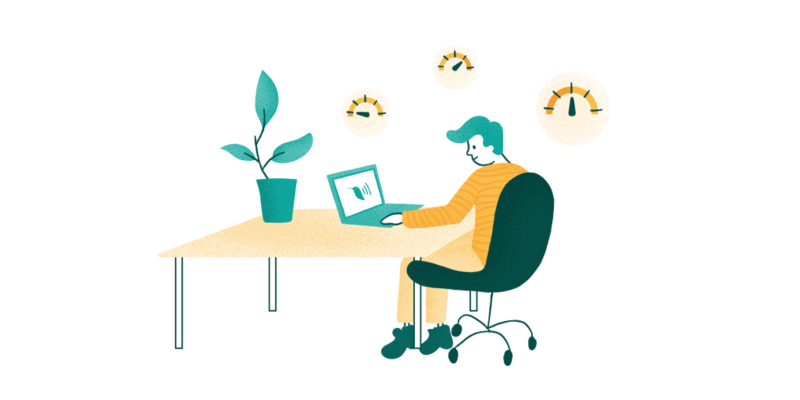 Any merchant can sign up to benchmark their ecommerce website, and we like to dive into the benchmark data to find key stats and unexpected trends. Comparing Shopify vs Magento benchmarks, we looked at the median performance of stores of all sizes in all sectors, and then just larger stores (those getting more than 20,000 sessions per month). 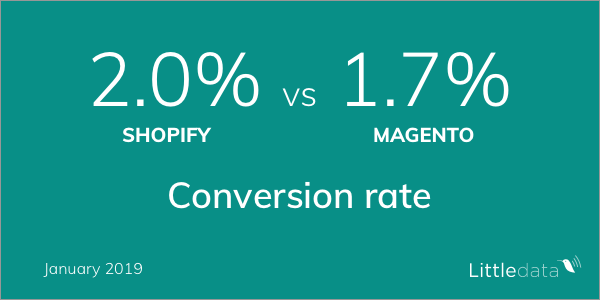 The headline news is that Shopify converts more visitors into customers than Magento, mainly due to better add-to-cart rate, but also slightly more efficient checkout conversion rate. However, since Magento stores have a larger average order (maybe because stores selling high value items are put off by Shopify’s percentage pricing) the Magento stores get more revenue per visit. And it is really the higher customer lifetime value that you should care about (Shopify agrees). Magento stores outperform on landing page engagement and marketing, and have a significantly higher usage of product search. The headline ecommerce conversion rate is better on Shopify (2% vs 1.7%) and this actually widens for larger stores (2.3% Shopify vs 1.5% on Magento). This is reflected in Shopify being better on both underlying metrics of performance: add-to-cart rate (5.5% vs 4.6%) and the percent of those starting to checkout. The checkout completion rate is actually better on most Magento stores (48.6% vs 51.3%), although for larger stores this is flipped around (50.0% Magento vs 48.7% Shopify). 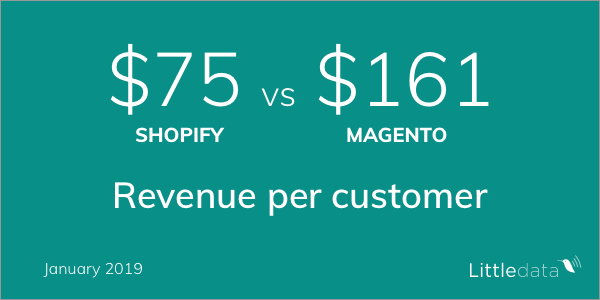 Average revenue per customer is much higher for the Magento stores surveyed (and this difference persists for larger sites) – $75 USD per customer on Shopify vs $161 on Magento. This is driven by both a higher average order value, and more repeat purchasing on Magento stores. This extra money per order more than compensates for the lower conversion rate on Magento, and means Magento stores get an average $2.79 per visit versus $1.52 for Shopify store visits. There are two factors to website speed – how long the server takes to response, and how long the page takes to render in the browser. 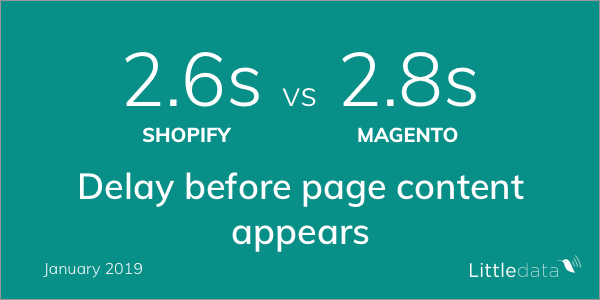 Shopify’s cloud infrastructure is better at the former (609 milliseconds versus 967 milliseconds average server response time on Magento), but for the more important delay before page content appears there is little difference between the platforms (2.6 seconds for Shopify vs 2.8 seconds for Magento). Larger Shopify stores do typically install lots of 3rd party apps, which can increase the script load time, and so the time to full page load is higher on larger Shopify stores (6.8 seconds vs 6.0 seconds on Magento). There are some big differences between how Shopify and Magento store owners go about Marketing. Shopify stores get a far higher proportion of traffic from Facebook (5.8% vs 2.7%), but this is still below the global average for Facebook referrals. Shopify stores also had a greater reliance on the homepage – showing a lack on content marketing sophistication (34% on Shopify vs 25% on Magento). The interesting difference is a much higher use of site search for Magento stores (3.1% Shopify vs 10.8% Magento). This may that Magento themes make it easier to implement site search, or that Magento stores with larger numbers of SKUs. And Magento marketers manage to get a lower bounce rate from emails: 50% on Shopify vs 44% on Magento. This is maybe due to a greater variety of email landing pages or campaigns. What about Shopify Plus vs Magento Enterprise? Many of the same differences are there for Shopify Plus (the equivalent of Magento Enterprise Edition for larger stores). Shopify plus stores manage a higher conversion rate (2.6% vs 1.6% for Magento EE), and but still have a lower average value per session ($2.12 on Shopify Plus vs $3.23 on Magento). And Plus stores, with more customised themes, still get a higher bounce rate from mobile search (55% vs 51% for Magento). If you’re looking for more info, we have a useful post on the general differences between Shopify and Magento, and our friends at Electric Eye have an extensive breakdown of how Shopify and Magento pricing and implementation really work for merchants seeking the best ecommerce platform for their business. For an in-depth look at enterprise ecommerce options, we recommend checking out the big Magento 2 Commerce vs Shopify Plus comparison by Paul Rogers. An expert in ecommerce replatforming, Rogers has worked with Magento brands including O’Neills, Agent Provocateur, Waterford, Royal Doulton, and Shopify Plus brands including Bulletproof, Trotters, Oco, Current Body and ESC. Looking for more performance data? If you’re interested in the topic of Magento vs Shopify performance, you can view our public listing of detailed Shopify benchmarks and Magento benchmarks. We’ve made it easy for anyone to dive into the data for themselves. And if you have an ecommerce website, sign up to benchmark your site for free!